Player Profile: The Bernardo Family. Photo by Susan Scandiffio. Growing up, there was always THAT house. The house where the neighbourhood kids met up. The house where kids could walk in, usually unannounced, and make themselves at home. (And sometimes make themselves a sandwich without anyone blinking an eye). The house where everyone felt welcome and knew there was fun to be had. THAT house for many Leaside kids is the Bernardo house. With three fun kids, parents who are kind and welcoming, and an open door (the door was literally open the day I went to meet the kids), the house is an inviting place. It’s also an active house. 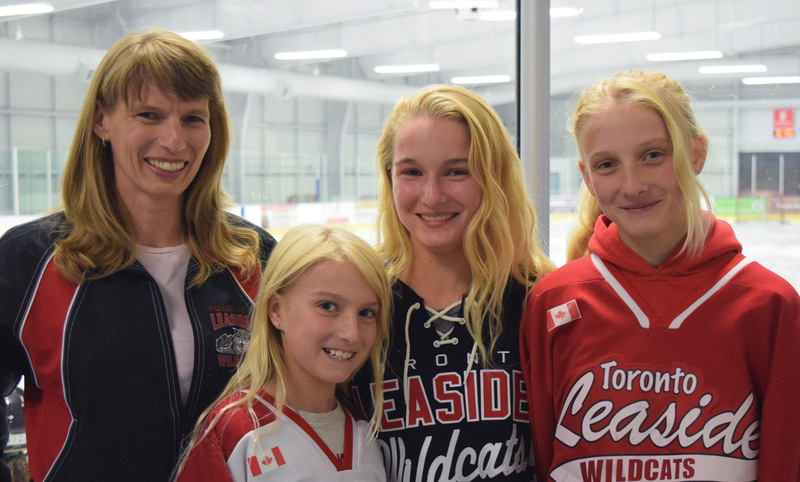 All three kids are involved in a myriad of activities, and all play Leaside hockey. Meet Thomas, Grade 7, Tadhg, Grade 3, Sophia, Grade 1, and their parents, Jill Richardson and Brian Bernardo. Growing up in London, Ont., Brian was an avid hockey player. Growing up in Ireland, Jill was not. But they are both full-on hockey parents with driving duties, which parents of hockey players will completely understand. 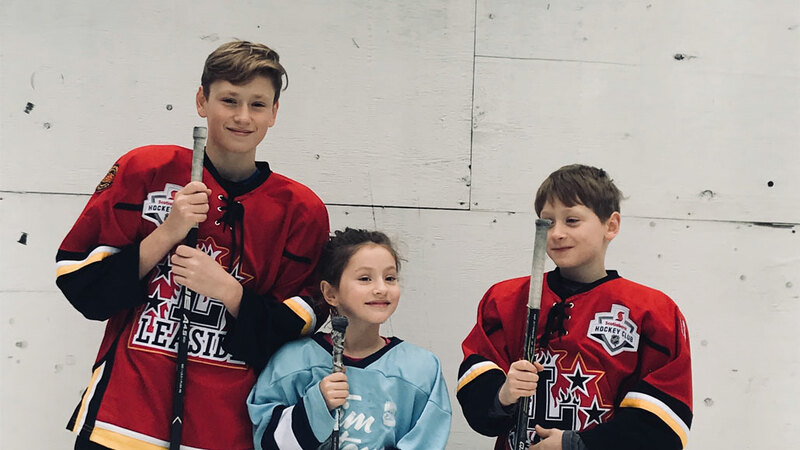 Whether it’s early morning practices, rush-hour drives to rinks far and wide, or tournaments around the province, the family is on the move. 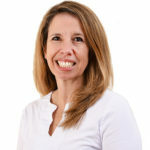 They are thankfully part of carpooling networks, which alleviate some of the load. They’re also a family who like to play hockey together. Brian is a master backyard rink maker and they also love to meet up with friends, when their schedules allow, for scrimmages at Hodgson Rink. 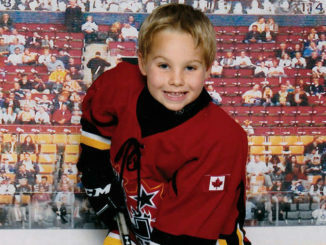 Thomas plays left-wing on the Leaside Peewee Red Select team and wears his dad’s old number, 8. He’s a fun and studious kid who admits to staying up late reading and has a massive friend group, many of whom he plays hockey with. He also plays baseball, basketball, volleyball, and golf. He loves to play electric guitar and is starting to write his own music. Thankfully, according to his mom, he no longer has early morning practices…which works well for a kid who loves to sleep in. Tadgh plays baseball and soccer in the summer and has no problem getting up for 6:30 practices during the week (eek!). He wears the number 16 (double his dad’s number 8). While he really, really loves hockey, his mom thinks that their dog, Rua, might be an even greater love. Both boys play 3 on 3 hockey in the spring, and both love playing Fortnite. As their mom points out, hockey is fantastic for keeping them busy and away from online video games, at least for a little while! 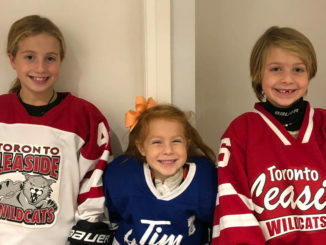 Sophia is in her second year of Leaside hockey as a minor novice. At this age, girls alternate positions and when asked what her favourite position is, she says, playing in net. She’s a strong skater and also a creative kid who loves to do art, dance, and gymnastics. Acro is her favourite. Sophia’s schedule is currently the most “popular” in the house as her practices and games are only on weekends. This family is fun, kind, and welcoming. Just go by their house. There’s a good chance the door will be open. Are you a Vision Zero champ?